We continue to share stories that come to our Fund's email. "Hello! My name is Irina! I help the mother a girl with cerebral palsy to raise funds for rehabilitation! Mom's name is Julia Nistiuk, the girl's name is Sofia, they live in a village near Minsk. Sofia had to be born a healthy girl. Her mother arrived to the maternity house in time for the delivery. During delivery process the child had asphyxiation, which resulted in cerebral palsy, spastic quadraplegia. 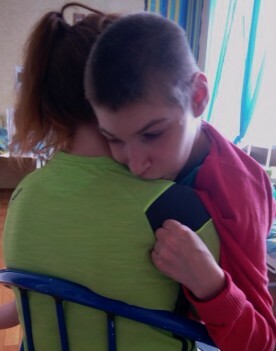 For the next 4 years of the child's lifethe mother took her to centres "Mother and Child" in Minsk, "Tonus" in Brest, in Bolodarskogo centre, to Yevpatoria children's clinical sanatorium (Ukraine), but there is no result. Sofia does not sit, does not walk, does not hold things, does not speak. She really needs serious rehabilitation. Before the New Year Sofia's mom received a response from the rehabilitation center "Love Angel" in China, the center is ready to take Sofia with her mother in September! But the amount to pay is 11 344.2 dollars, and they also need money to cover travel costs. And as Sofia is raised only by her mother, this is an unbelievable amount. Thus they apply for support of caring people. Home address: 223056 Minsk district, Urozhainaya village, Armeiskaya Street, 86 - 18 Nistiuk Yulia. We would be grateful for any help!" Varvara not for a second allowed the thought of failure to cope with the disease and she always believed she’d be the winner in the unequal battle with the severe disease. This little girl immediately realized that only unconditional faith in herself would help to conquer cancer cells. Now Varya is an ordinary child who really wants to believe in her bright future. Diagnosis: right adrenal neuroblastoma combined with damage of paraorthal lymphnodes and lymphnodes of vascular pedicle of the left kidney T3N1M0, Stage 3, after the comprehensive treatment - remission. 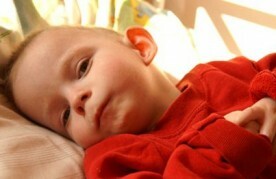 Varya was diagnosed with it in November 2010, in cancer centre in Borovliany, Minsk district. Initial treatment was carried out in Borovliany clinic - 6 chemotherapy blocks. Since there wasn’t a possibility to perform a surgery in Belarus, we went to an Israeli hospital Schneider, where the tumor was removed by 98%. After Israel she underwent 4 more chemotherapy, beaming and 8 months of dry chemo (Roaccutane). There was a long-awaited remission in 2012! The children with this diagnosis should have preventive assessments every six months for 5 years. Thus we need to go back to Israel to fully examine and check Varya’s condition!!! Neuroblastoma is the most poorly studied and insidious form of pediatric oncology. Very few survive. Our girl is the lucky one! But cancer is dangerous and may recur. We are all fighting for Varya’s life, this is our mutual victory! Now is very crucial moment - a 5-year remission threshold and half way to healing is passed. His example proves: Cancer is curable. Please, help us to make sure that the disease does not go back!!! Karbysheva Str , 13/2, UNP 600052608; MFIs 153,001,520. Many sencere thanks to everyone!!! ‘Fragments from the nuclear explosion fallout at Chernobyl station which blew into the sky on 26th April 1986 landed on us. 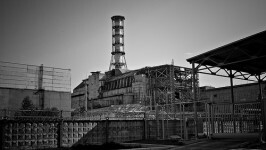 At first we heard only of rain clouds bringing devastation, of animals contaminated by radiation. We were told – ‘don’t go there, not if you are young, or pregnant, or ever want to be pregnant; not unless you want to come back with two heads, several cancers and the likelihood of more. Don’t go there! But we went anyway.’ (From ‘Fallout’). In the quiet and dark of the night – of this night – thirty years ago as we all slept quietly, the world changed. For some it was just a news story the next morning on their news channel. For others, it was in their lives, in their bodies, in the very air. And no one told anyone! Nobody really knew how much damage was being done. The beast released into the night air could not be recalled, could not be brought back. The genie was out of the bottle – with an evil that spread quietly and gently and deeply into the lives, into the minds and bodies of people – of children – we have come to know and love. Thirty years on and we are still involved, still making that journey to Belarus. We go there not because of nuclear power or contamination. We go to meet those who are now our friends, our pals – and we go because we enjoy going there, we love going there. that whatever evil that is about to be coughed up on top of our beautiful world will somehow be contained this night and not released. To make us all a little better. Let us hope for something. Something small. Something beautiful. Something that will grow and creep like a rambling rose over the wall into our neighbours minds and hearts and souls around our beautiful world. Let us hope this night for something beautiful. Let each of us be that something small. “Hello, we are appealing to all who have the opportunity to help Sergei do the fourth rehab course in clinic " Love Angel " in China,” - says Sergei’s mother . Another heartbreaking story and another request for help. Little girl Darina really badly needs your attention and support. My name is Anastasia Kolonitskaya, I am the mother of a special child Darina. Daryna was diagnosed with cerebral palsy. She is 2 years now, but she can not hold her head, sit or talk and eats through a tube. But despite all the difficulties, we do not lose heart and fight for a better quality life for our girl every day. In 2015, we fundraised money for a trip to The Institutes for the Achievement of Human Potential (Italy). With the help of caring people we were able to take the baby for a visit and get a competent examination. The specialists of The Institutes for the Achievement of Human Potential Darin examined Darina, noted a positive change (Daryna’s hearing and vision improved) and developed a rehabilitation program for the next six months. We have a program of various methods including usage of respiratory masks, learning to communicate with Darina on the board of choice, hearing program, vision and tactile stimulation, three types of patterning and we also increased the number of sliding down on sloping floor. And as the child progresses the constant adjustment of the program is needed often, so we have another appointment for July 4, 2016. Visit price: 5250 $ and 3155 € + travel costs. We’ve also fundraised money for a trip to Moscow for the introduction of umbilical cord blood cells in KrioTsentre. It took us a long time to study this procedure, we considered the opinions of parents, who had already tried this method, communicated with experts and we realized that this is our chance! This is the chance for our daughter to see the outside world, the chance of a significant reduction in spasticity and hyperkinesias and to improve physical activity. We hope that this will become a new impuls to Darina’s development . The cost of one implant is 77,000 Russian rubles. We need to make 6 implants: first 2 with an interval of 2 weeks, then every 3 months. Thanks to the funds collected, we have already made 2 implanting procedures, the next one is expected in July. Miracle happens, where he was waiting for! We are looking forward to, hope and trust and ask for help from all of those who care! The required amount is 6150 € + 11 200 $. We have already fundraised 1050 €, 5672 $. Thank you very much for all your support!!!" "My friend’s family has a great misfortune! Their daughter Camellia, 1 month old, was diagnosed with retinoblastoma. This is eye cancer. The family did everything possible to take the baby for medical treatment to Germany. They are already there. The treatment costs 50,000 euros. A lot of people have responded to trouble from everywhere. The family is also supported in Germany, some people have alreadycontributed EUR 5,000 and the hospital has also provided them with a free room as it is a unique case. Camellia is the only newly born child with such a disease in the world. She is now with her parents in Berlin in clinic Charite. Please, support Camellia and let her see this beautiful world and the people who have not passed by and helped her !!! Payment purpose: To be admitted to the charity account opened in the name of Kopysheva Taisiya for the treatment of Camellia Demchenko.". 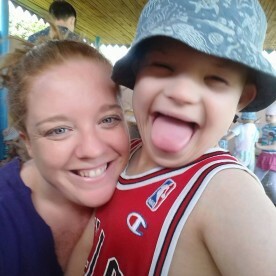 I am a mother of three children, one of them is Matvei - a child with disabilities, he has a diffuse lesion of the midbrain, congenital heart defect (trisomy of chromosome 21), and other conditions. In July 2014, I visited the American courses, held in Moscow on "What to do if your child has brain damage." In September we were in Philadelphia, thanks to family and friends (they bought the tickets) and all the people who donated money. Taking into consideration his diagnoses we put together a program for six months. In March 2015, we paid a second visit there. This program changes as the child achieves the certain development objectives. The cost of travel 10 000 Dollars, taking into consideration the payment of the lectures course for parents and teaching methods of the rehab, tickets, visas and accommodation. A trip to the rehabilitation institutions Glenn Doman in Philadelphia - is not a whim, it's a chance for Matvei to restore the lost brain function. The program, in which we are engaged on a daily basis is very difficult, not every parent is ready to accept the way of life for the sake of their child, in spite of the good result. It is very difficult, but the result is fantastic. How it happens is a mystery of nature. Our child is becoming smarter day by day, he makes us happy with his success, and this gives us the strength and confidence that everything will be fine. It is necessary to continue and not give up. We consistently treat the main cause of Matvei’s problem - the diffuse lesion of the midbrain. Every day we undergo physical, intellectual, manual, physiological and respiratory program. The entire program is created for Matthew by experts and it became the way of life for us! 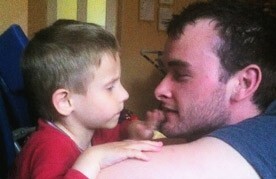 He still doesn’t speak, sensory is damaged as well as the motor skills. The possible reason why he doesn’t speak is lack of oxygen supply to the brain, as well as problems with the hearing. Only specialists of the Institute can help Matthew to achieve a good level of development, they have designed a unique technique that really helps the children with such diagnoses to develop normally. No organization here is willing to deal with such Matvei’s problems in complex, but we of course still desire to help him as soon as possible. We see the results! Matveyushka can look after himself, he understands and tries to be helpful in the family and is actively involved in domestic affairs, he has viewed by over 3000 encyclopedic facts, read more than 400 books and passed all arithmetic tasks as the part of the intellectual program. He also started improving physically. The everyday programme consists of physical and intellectual tasks. Respiratory program consists of respiratory patterns. All this is to oxygenate the brain and to show it how to breathe correctly. We just carry a tactile and auditory stimulation. All programs are designed for the damaged areas of the brain. Brain is a muscle, which is growing in its active use. We ask you to support us in this long marathon to raise funds needed to continue treatment that was begun! We need not only material, but also information support! Do not leave us, please!!! Nikita needs rehab. Let's support him! "Hello, my name is Oksana, I have a son - Nikita. Nikita is 3 years old, his main diagnoses are cerebral palsy, spastic hemiplegia, post-hemorrhagic occlusive hydrocephalus (a condition after ventriculoperitoneal shunting). Nikita is able to talk now. But his musculoskeletal system is impaired (tight right hand, low physical activity, the left hand is active – he can take things, attempts to eat independently). While walking with support on two hands he intends to tip-toe and then step on the whole foot but with legs crossed. He can not sit for long without support, and he cannot sit down independently. Nikita was born prematurely (30 weeks), on the 4th day he had a brain bleeding, which caused hydrocephalus. He had a surgery at 1.6 months. For a long time Nikita was on artificial lung ventilation (about a month). He was discharged home at 2 months with psychomotor retardation, and then every 2 months we went for the rehabilitation to the Republican Scientific and Practical Center * Mother and Child * (4 times), Since he was 1 year we are undergoing on the rehabilitation courses in Minsk city center of medical rehabilitation for children with intellectual disabilities (were there 9 times), we go to the rehab centre Zhivitsa (Gomel regional Hospital), and do regular courses of massage and physio in the community clinic, also we regularly go to the pool. As the time goes by, the dynamics is positive, but it is very slow. We decided to take Nikita in the specialized sanatorium for children with cerebral palsy in the Czech Republic for the first course of rehabilitation treatment, which costs 4470 euros. It is not possible for us to save such an amount in 3 months, so we are asking you for your support! - Russian Ruble - Transit account 3819382104993 for the charity account 000008 in branch 511/197. Payment purpose: for treatment Yaroshik Nikita. +375 29 7887709 – that’s the number that you can top up, and the family can withdraw the funds towards treatment. Little Timur Zulfalievu was born a perfect child. And neither his mom nor specialists noticed anything special about him in the maternity house. But later on his mom Veronika started noticing that Tsimur doesn’t breath regular. First their doctor said it was just a flue. But then after some more check-ups he was diagnosed with spinal muscular atrophy Verdnig-Hoffmann type 1. The family tired various clinics to help his condition, but the child was only getting worse. Now he needs a ventilator to help him breathe. The family has managed to collect 6333.75 euros of the required amount of 10460 euros. But they still need 4 126.25! For those who could understand a bit of Russian here is their social network page, where one can see the updates! 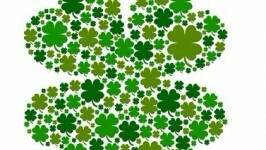 From the bottom of our hearts let us wish you a happy St.Patrick's Day! May it be a truelly enjoyable day!!! Special greetings to our friends, partners, volunteers from Ireland - Burren Chernobyl Project, Chernobyl Children's Trust and to everyone else! Hurray! My name is Tamara Kostyuk and I’m writing to ask you for help. I have a daughter Yana, she is 12 years old. She has cerebral palsy (CP). Right sided hemiparesis. Arachnoid cyst of the left temporal lobe, the pineal gland cyst, and some vision impairment. In October 2015 Yana had an ankle surgery. It went well, and now she needs to start rehabilitation. There is a great chance to stop atrophy of muscles of Yana’s right arm and leg. In January, Yana had a very good rehab course in a rehabilitation center Adele in Slovakia. We got help from JuniHelp Fund to pay rehabilitation. Now she needs to go for another course which costs of more than 9,000 euro, taking into account travel and accommodation expenses. 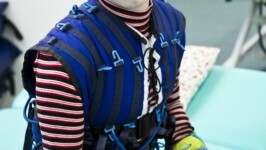 Rehabilitation course lasts 24 days. But unfortunately we can’t cover the whole cost ourselves as this amount is too large for our family. Yana is the sixth child in the family - she is the youngest. We have been treating her all her life. Older children have their own families. I beg you to help my daughter improve her health and learn everything healthy children do. Yana understands everything, goes to school, but is engaged in the special program. It is difficult for her to speak properly. But with every day the speech improves and it’s easier for Yana to communicate in the classroom. She loves to be at school. There are very good teachers, and Yana always feels support of the seniors and her friends. I do not ask for immediate help. I hope there will be good people that will help us. MTS number +375 29 5668683 Money from the mobile account will be transferred to the charity bank account. Address: 211809 Tsentralnaya Str., 39 village Meretskie, Glubokskyi districkt, Vitebsk Region. Nota bene: some humor and not only. "What was it Shakespeare wrote? and milk comes frozen home in pail….? 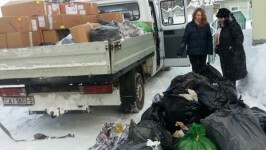 Then what happens is that trucks arrive to Dom Zara Minsk (Dobra tut office) for the collection of Humanitarian Aid sent from Ireland again by Burren Chernobyl Project. This year we are happy to have been able to help those from Pinsk, the children’s orphanage in Gorodishche, the old folks in Starye Dorogee, as well as many others. and yet they turned up in their small and their large trucks, through the snows, through the freezing temperatures, to collect the much needed aid. It hit minus eighteen at some stage during the distribution and yet everything got sorted, doled out and delivered where needed. Shakespeare was correct – ‘when blood be nipped and ways be foul’ - then is the time when the stalwarts of Belarus face out onto the cold and carry on with the work, loading and collecting, shipping and counting and bringing the aid back home where it is most needed. Dear friends, we'd like to share our family history with you. In December 2012, we found out that very soon we would have twins. A sense of joy overwhelmed us, everybody shared our happiness. At the scheduled ultrasound the doctors told us that we’d have two boys. As time went on, the pregnancy was normal, the kids were growing up, and we planned a happy life of our large family. At the 26 week of pregnancy, we went on a scheduled ultrasound, along with the husband, the doctor who did the ultrasound, asked for permission for the students to present, as we had twins, so we did not mind. The ultrasound told us that our boys were ok, all organs were formed and weight was normal. The doctor showed the face of one of the twins, saying that the second one was shy and turned away. Our happiness was enormous. In July at the planned check up with the gynecologist we did a CTG that said all was well and so we were scheduled for the next ultrasound at the 32nd week. We will never forget this day. At the ultrasound check we were told that one of our kids died at the 21st week of pregnancy, and the second would be born with congenital abnormalities as he spent a long time together with the dead baby. July 9 at 12.33 our Sasha was born. Since that day we are fighting for his life so that he has a life of a normal child. So far, we have done rehab in Brest centre "Tonus". He is constantly undergoing courses of massage at home. Starting with August we’re scheduled for the swimming pool, and a speech therapist. After so many assessments we were told that the best thing is to try a technique Vojta, which is used in Helios Clinic, Germany. Therefore, it is there that we are hoping to get. The clinic is ready to accept us as soon as we have the necessary amount of money. We don’t have that much time to fundraise money thought as most effective treatment is before Sasha reaches the age of three. Million thanks for your help! Ilya can go to school with your support! We can't leave this story, where you can become the heroes, unattended! 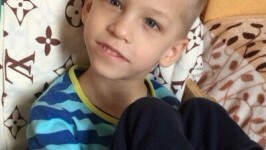 Please, help Ilya to go to school with his peers! 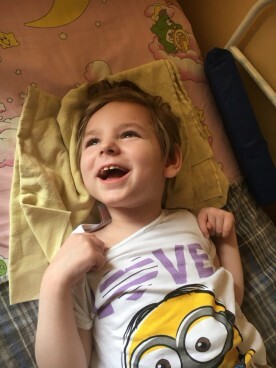 Family Korenyuk from Lida is looking for your help in fundraising to pay for the rehab courses in "OLINEK" center, Warsaw for their 8-year-old child Ilya Korenyuk, as the family has not enough funds to pay for expensive rehabilitation courses, which cost 2000 euro. It’s only the father of the child that works and the mom is looking after the child. Ilya is the second child in a family. Pregnancy was going ok. The child was born in time, with the weight of 3950g. At birth he was a perfectly healthy kid, developing well. It happened at the time of the first vaccination ...” Ilya was very yellow and I informed the doctor about it before the vaccination.”- The mom is telling Illya’s story.- “But she said that it was physiological jaundice, and that it would pass soon, and it was better to do vaccination while it was available. By the evening of the same day the temperature started to grow and the child was vomiting and eventually ended up in the intensive care unit. A CT brain scan showed a hematoma, which had to be removed. But in Lida there are no children’s neurosurgeons, and when the doctors began to call to Minsk, they were told to sort out the problem in the regional center, but in Grodno (which is the region centre) there are also no children’s neurosurgeons ... in Grodno emergency hospital the interns (Africans) agreed to operate, led by an neurosurgeon for adults. They conducted a brilliant operation and said that would be a pity if the child didn’t survive. By the way, the head told me "Do not worry if he doesn’t survive, because if he does, he will be just a vegetable." 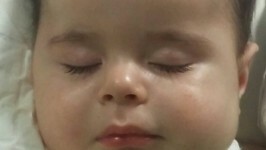 When hematologists from Minsk arrived, Illya was diagnosed with the hemorrhagic disease of the newborn, and I was told that it was the reason why the child was yellow and if we hadn’t had the vaccination, nothing would have happened. In most cases it goes on unnoticed for 2-2,5 months for the children, if there is no vaccination done. But our case was unfortunately different. But God stood by us! The child survived. Long years of rehabilitation brought very good results. The doctors cannot believe it. We were constantly going for the rehab in Grodno, Minsk, Brest, in Lithuania. We work with a great osteopath. 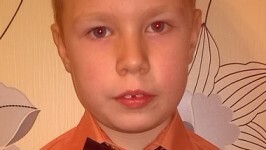 Ilya went to the kindergarten in three years. With great difficulty we tried to get into a regular one, but if the child has a problem, he isn’t needed. In September 2016 Ilya is going to go to school. He just needs a little bit of work to get to the level of his peers: to develop a full function of his left hand and to fully restore the speech. A doctor from Minsk suggested going to the rehabilitation center in Warsaw. The method they use there is called the "Tomatis" and it is very effective. But the child must have 3 courses with an interval of 4-6 weeks. The cost of the course is about 2 000 euros. We have never ever asked for, having coped on our own. But now for now it’s is a big amount that we can’t cover ourselves, thus we are looking for your help! 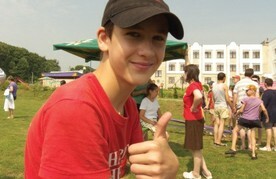 Please, help Ilya to have a pretty normal life around his peers! Charity account: number 000078 JSC "Belarusbank" branch 413/07 Lida, Sovetskaya Street, 17. branch code 696. Transit account No 3819382104109. Currency code 974.